Snakes are creepy little creatures and can find their way through tight spaces with ease. Whether you’re a lover of the slithery genre of animals or suspect a heart attack upon hearing the word “snake,” we can imagine that seeing a snake pop out of your toilet when you go to use the loo isn’t going to be a pleasant experience. While this isn’t a common instance, there have been several documented moments of snakes slithering into your plumbing work and scaring the heck out anyone unfortunate enough to walk into the bathroom at that moment. If you suspect snakes are slithering through your pipes, call animal control, not your local plumbers. Sleep easy tonight knowing that there may or may not be a quartet of fifteen-year-old crime fighting turtles living in your sewers and eating the occasional pizza. While they’re a step up from snakes, it’s still a bit unsettling knowing that your “business” is being flushed into the home of some mutant turtles. I mean, they’re just teenagers! Because of these young turtle friends working to keep the sewers safe, our plumbing company fully endorses only flushing things that are safe and not hazardous. Woe be the day we had to flush our dearly beloved, Fishy-Fishy, down the toilet after an unforgettable week together following the county fair. Millions of deceased goldfish will forever roam the drains and sewers, at least in spirit. For future goldfish that will [sadly] die, we highly recommend looking into a bio-clean application, which Mojica Plumbing & Drain Cleaning specializes in. That way, you can feel good knowing that poor little fishy, innocent as they were, is smoothly sailing down your drains and into fish heaven! Call us for a bio-clean application before the next county fair! Imagine you’re a first-year witch taking a stroll through Hogwarts and you need to use the bathroom. You stroll into the notorious first floor girl’s lavatory, only to see the ghost of a young witch fly through the toilets in one of the stalls and scream at you! You’d be startled, right? Moaning Myrtle is one of plumbing’s favorite ghosts. Though she might be a tad bit unsettling, we empathize with her unfortunate past which forever linked her to the plumbing in that bathroom. Moaning Myrtle has a tendency to disrupt some faucets and pipes. If you have your own plumbing ghost or ghoul who’s causing damage to your bathroom or kitchen, Mojica Plumbing & Drain Cleaning is happy to come help! What’s the logical answer to updating the sewer system in a city that’s growing quicker than it can realize? To city planners in Chicago, the answer seems to be raising the entire city a few feet off of the ground! The Windy City originally was too low to effectively drain sewage, so they reasoned that picking the city up a few feet would be a good answer. In the 19th century, Chicago raised the street level as well as the buildings and structures so as to form a more comprehensive sewer system. After a few years of work, the project proved a success! Amazing! 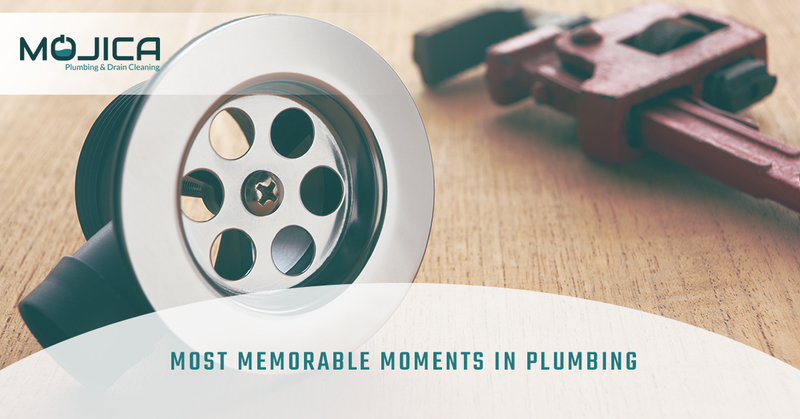 Today’s blog was to emphasize that plumbing has an interesting set of moments that make it all so special. Without plumbing, these situations would have never come to light and we at Mojica Plumbing & Drain Cleaning wouldn’t exist to talk about them. We hope that snakes stay far away from your toilets and that ghosts don’t break pipes and faucets. While we could only go so far in plumbing repairs, we’d be happy to help with the reasonable requests! Call today.